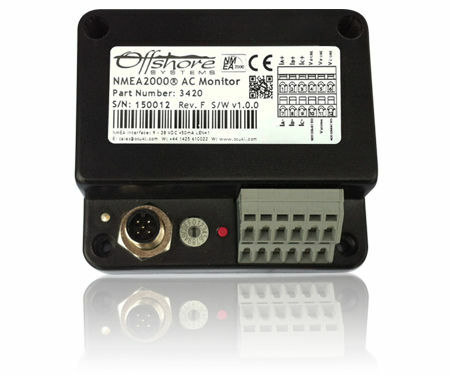 The Offshore Systems 3420 AC Monitor accurately measures the AC voltage, AC current and AC Frequency and reports them over the NMEA2000® network. The unit can be used for Single Phase, Bi Phase and Three Phase systems and is suitable for measuring AC sources such as Shore Power, Generators and Invertors. It can also measure the voltage and frequency on AC Bus Bar Systems. The voltage sensing is by simple phase and neutral connection to the unit. Current sensing is done by a state of the art AC Current Transformer placed around the conductor with no need to break the connection. The unit has inputs for up to three phase voltages and up to three phase current transformers. It is supplied with a single phase current transformer. Additional transformers will be required to measure Bi Phase or Three Phase circuits. The 3420 has a blue LED that flashes as the unit transmits data over the network and a rotary device instance switch to allow local configuration and up to 16 units on a single network. The connections to the sensors are made via boat builder preferred WAGO Cage Clamp terminals which allow either solid or multistranded wires from 0.08 to 2.5mm² to be connected quickly and securely. Much more secure than screw terminals which can vibrate loose over time. The unit is certified to the NMEA2000® network standard.